'Dr. 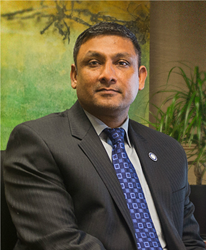 Singh has been a dedicated member of the National University leadership team, and he is held in high regard by faculty, staff, and administrators,' said Dr. David Andrews, President of National University. Dr. Gangaram Singh, an award-winning educator and administrator with a background in leading strategic growth initiatives, has been named Provost at National University. Dr. Singh, who had joined National University in 2014 as Associate Provost, had been serving as Interim Provost over the past year and became Provost effective July 1, serving as the University’s chief academic officer to the President. Dr. Singh brings strong ties to the San Diego community, having previously served in key academic leadership positions with San Diego State University (SDSU). At National University, which is one of the largest private, nonprofit universities in California, Dr. Singh has been active in strengthening academic infrastructure for the next generation of adult learners. He assumed leadership of the University’s regional accreditation (ACS WASC) process, and has been working closely with faculty to identify new approaches for highlighting scholarship and research, such as through the University-based Journal of Research in Innovative Teaching. With a Ph.D. in Industrial Relations from the University of Toronto, Dr. Singh has been widely published in over 70 academic and practitioner journals. Recent articles appeared in the Journal of Management, Human Resource Management Review and the Journal of Management Inquiry. He has presented at the Academy of Management, Industrial Relations Research Association, and the Canadian Industrial Relations Association. At SDSU, Dr. Singh served as Department Chair, Associate Dean and Interim Dean with SDSU’s College of Business Administration. While there, he contributed to the strategic renewal of SDSU’s College of Business Administration by leading the AACSB maintenance of accreditation and participating in SDSU’s educational effectiveness team, assuring compliance with the Western Association of Schools and Colleges (WASC) standards and supporting continuous improvement. His collaborative leadership efforts achieved notable results, including the school being named in “Top 100” rankings for the College of Business Administration’s MBA program. Dr. Singh has received numerous teaching awards at SDSU and at Case Western Reserve University, where he taught before joining SDSU, including “Most Influential Faculty.” He is committed to community outreach, having formerly served on the City of San Diego’s Citizens Review and Economic Competitiveness Commission.